William Hugh, who died in the Great War of 1914-1919, was the third of the six sons of Henry Cubitt, later 2nd Baron Ashcombe. 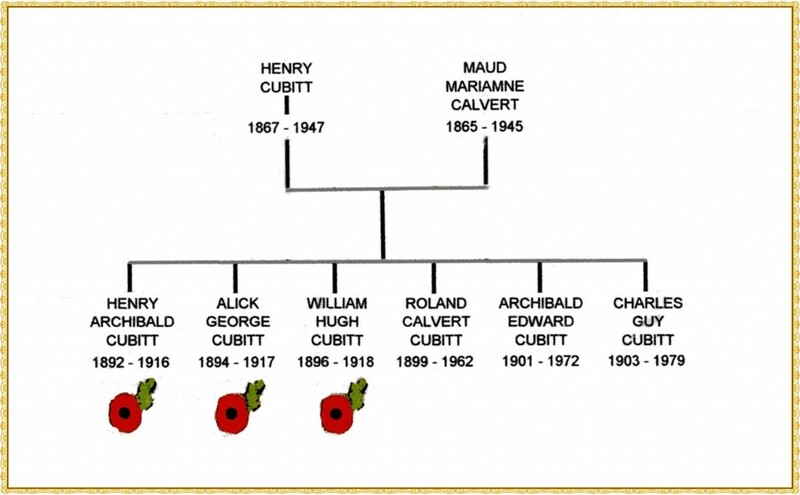 His two elder brothers who also died in the War were Henry Archibald Cubitt and Alick George Cubitt. All three, along with their younger surviving brothers (Roland, later 4th Lord Ashcombe, Archibald Edward and Charles Guy Cubitt) were grandsons of George Cubitt, lst Baron Ashcombe (who founded St Barnabas Church), and great grandsons of Thomas Cubitt, the great Victorian builder who bought and developed the Denbies Estate in 1850. More information on these family members will be found on their respective pages.